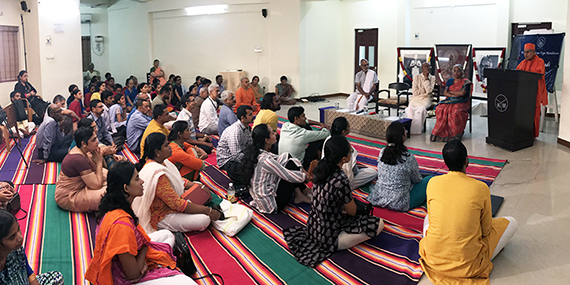 An initiative by the Research Department of KYM – Yoga-vaiśāradī (www.kymyogavaisharadi.org) is a web application that is developed with an objective to facilitate easy access to the classical commentaries of Yogasūtras of Sage Patañjali. Vaiśāradī means an expert. This web based tool is designed to facilitate expertise and scholarship in the field of Yoga Philosophy. 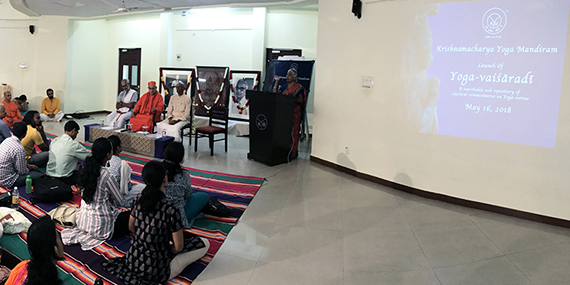 The web application was launched on May 16, 2018 by Srimat Swami Gautamananda Ji Maharaj, Vice President of Ramakrishna Math and Ramakrishna Mission and Prof S Padmanabhan, Head, Department Of Samskrit, University Of Madras, Chennai. There are more than a dozen Sanskrit commentaries to the Yogasūtras. They can be classified into two types. Sanskrit commentaries that are independent of Vyāsa’s commentary. The project is envisioned in two phases. Phase one of the project focuses on Vyāsa’s commentary and its sub-commentaries (and their sub-commentaries). 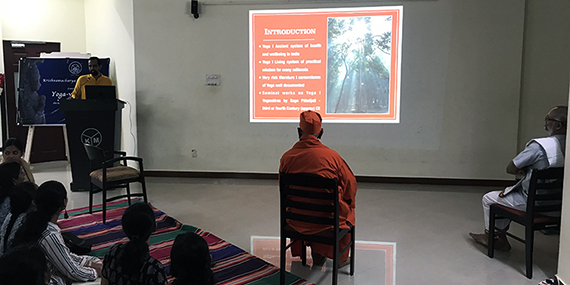 Yoga-vaiśāradī – Phase two focus is on classical Sanskrit commentaries of Patañjali Yogasūtras of the second type. Vyāsa’s commentary to the text is considered the closest to the period of Yogasūtras and hence respected as primary commentary. Regarding the authorship of this primary commentary there are various views. While some scholars consider the author of the commentary as Vindhyāvāsa, misspelt in some traditional manuscripts as Vedavyāsa, others consider Yogasūtras and Vyāsabhāṣya to be composed by the same author – Patañjali himself. Vācaspati Miśra, the first known sub-commentator to the primary commentary, holds the commentator to be Vyāsa. Yoga-vaiśāradī toes the line of tradition by following Vācaspati Miśra, as the issue remains unsettled. There are four known sub-commentaries to Vyāsa’s commentary to Yogasūtra. The first three are in public domain and hence have been digitised in a searchable way. Bibliographical details of Bhāsvatī of Hariharānanda Āraṇya is provided in the translation page. Along with these classical commentaries, the first chapter of Yogavallī, a Sanskrit commentary to the Yogasūtras by yogācārya Śrī T Krishnamacharya is provided. The views of Sri TKV Desikachar, son and student of Sri T Krishnamacharya on the Yogasūtras is also presented. Thus currently the first phase of Yoga-vaiśāradī has six commentaries of Yogasūtras. These are short summaries or explanatory notes on Vyāsabhāṣya and Tattvavaiśāradī. These will also be taken up in due course. The nine commentaries listed above are prominent published texts. These are being searchably digitized under the second phase of the project.